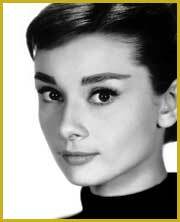 Audrey Kathleen Ruston was born May 4, 1929 in Brussels, Belgium to a wealthy and cosmopolitan family. Her mother, Ella van Heemstra, was a Dutch baroness and her father, Joseph Victor Anthony Ruston was born in Bohemia of Austrian and English descent. When her parents divorced, Audrey and her mother moved to London but returned to the Netherlands where they lived for the duration of the war. During the battle of Arnhem, 16-year-old Audrey was a volunteer nurse in a Dutch hospital that received many wounded Allied soldiers. One of them whom she helped nurse back to health was a young British paratrooper - and future director - Terence Young. More than 20 years later, Young directed her in Wait Until Dark (1967). During the war Audrey suffered from severe malnutrition and depression. In 1948, when she was studying for a modeling career a film producer saw her and gave her a bit part in Dutch in Seven Lessons. Three years later, Audrey went to the US where she thought there would be greater opportunities for her. Her first role in Hollywood was Roman Holiday in 1953. The rest is history. In 1988, Audrey became a special ambassador to the United Nations UNICEF fund helping children in Latin America and Africa, a position she retained until 1993. Her last humanitarian mission for UNICEF was to Somalia in September 1992. She was reported to have begun experiencing stomach pains towards the end of the trip, leading to her cancer diagnosis, two months later. Audrey Hepburn died on January 20, 1993 in Tolochnaz, Switzerland from appendicular cancer. Her two sons, Sean Ferrer and Luca Dotti survive her.